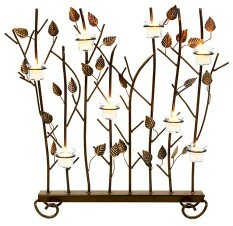 Like the "Birds" screen (SSB-01), this piece consists of a row of leafy branches, but instead of birds we have installed eight rings designed to hold votives and candles. You can light the candles during spring and summer nights and delight your family and friends with the friendly ambiance of fire without the heat. (Votives and candles not included). These screens are executed in wrought iron, powder coated in Roman Bronze, and accented with gold details.Summer screens are a great way to add beauty and interest to your fireplace in the months when it is not in use. We offer three designs, all of which can be used both indoors and out.